Constructed: most likely between 78 – 65 B.C. Since its erection up until the present day, the towering structure of the Tabularium serves as an impressive background for the west side of the Forum. Because the building was continuously occupied throughout the centuries, it has survived in such excellent condition, even though the upper stories of the ancient structure were removed in the 16th century in order to erect the Palazzo del Senatore, which houses the Capitoline museums today, on the remaining foundations. A dedicatory inscription which was discovered in the Tabularium names the person who had this structure built and thereby enables us to date the building: According to the inscription, it was the consul Q. Lutatius Catulus who erected the Tabularium together with its substructures. Catulus was consul in 78 B.C. and censor in 75 B.C. – the years in which Catulus held office delimit the time period in which the Tabularium must have been built. That Catulus is presented as the person who built the Tabularium is most often explained by the fact that he was (at the same time) responsible for rebuilding the Temple of Jupiter on the Capitoline Hill after its destruction by a fire in 83 B.C. Because it is possible that the fire also affected parts of the area north of the sanctuary on the Capitoline Hill, it could very well have been the case that Catulus not only rebuilt parts of the Capitoline Hill, but also at the same time erected the Tabularium. 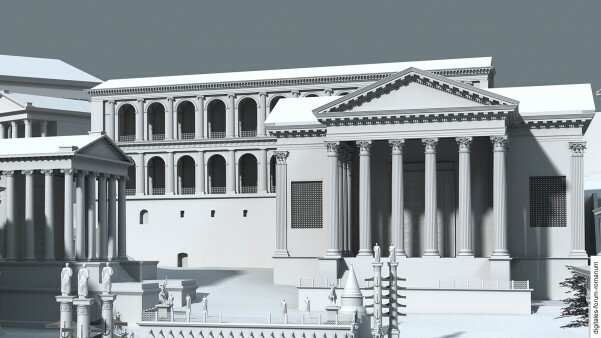 As it is known that Catulus was a supporter of Sulla, some scholars have argued that Catulus might have been implementing a plan of Sulla’s by building the Tabularium. Thus, it is also possible to regard the Tabularium as part of Sulla’s construction policy on the Forum (see Sullan epoch). 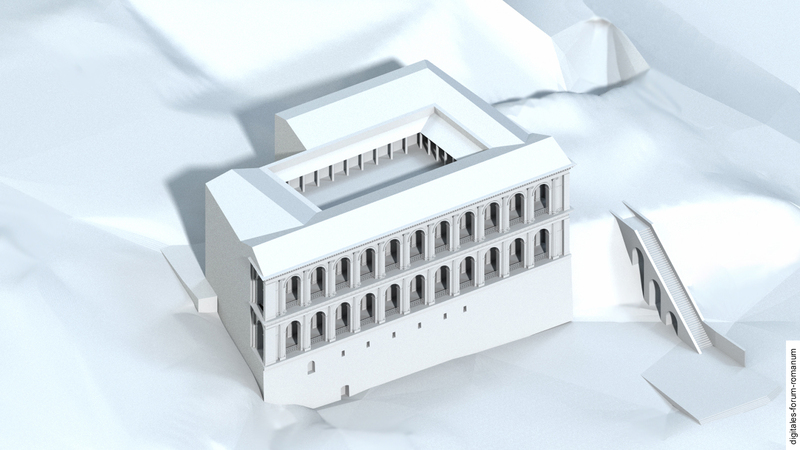 An examination of the archaeological record reveals no traces of a modification or rebuilding of the Tabularium in ancient times. We cannot be sure whether or not the building was damaged or restored in light of the fires on the Capitoline Hill in 69 and 80 A.D., which the literary sources inform us about. What makes the situation even more difficult here is the absence of the upper architecture, which might have had some such traces. We know the name and function of the building from another inscription that was discovered within the building, although it has not survived to the present day: This inscription mentions the erection of a “substructure” as well as of a “Tabularium”. This is where the common name that scholars use for this building derives from. From the Latin noun tabularium, which can be defined as archive, we can also infer what the original purpose of the building was: it was a place where documents where kept and stored. Within scholarship the Tabularium is often thought of as the state archive. 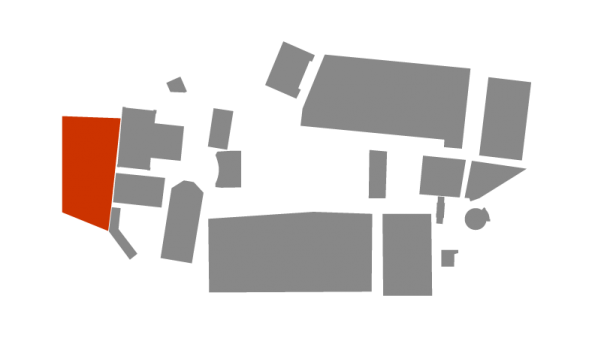 We have indirect evidence indicating that the structures on the western border of the Forum did indeed function as an archive. For instance, the Roman historian Suetonius writes of a fire on the Capitoline Hill in 69 A.D., which supposedly destroyed a number of bronze tablets (among other things, records dating back to the time that Rome was founded). These remarks certainly speak in favour of the existence of an archive in the area of the Capitoline Hill or at the western border of the Forum. Besides the dedicatory inscription, there are no other written sources that explicitly mention the construction of the Tabularium. Furthermore, there is no evidence (at least for the late Republican period) for a centrally organised archive system. We know of several buildings on the Forum which were used, among other things, to store documents – e.g. the Temple of Saturn or the Temple of the Dioscuri. This is why in the scholarly debate doubt is often cast on the identification of this building as a Tabularium. Accordingly, other buildings have been suggested that were supposedly situated on top of the substructures and apparently defined the primary purpose of the building complex – such as the Atrium Libertatis or different temples. However, no convincing case has been made for any of these alternative suggestions. 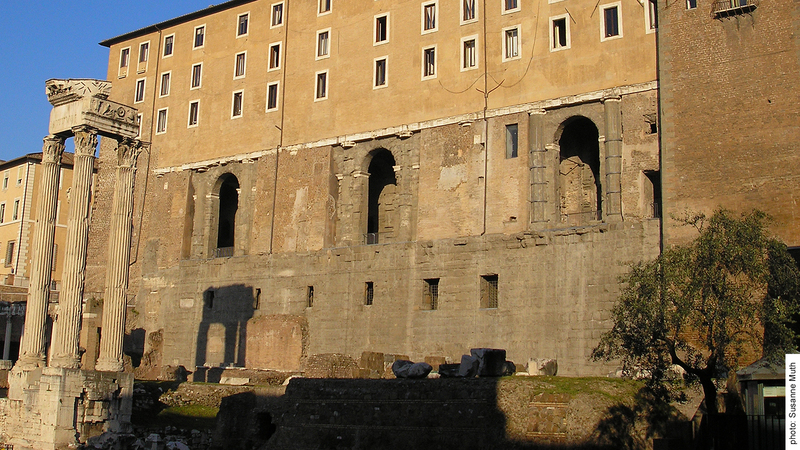 The monumental façade of the Tabularium, which faces the Forum at the present day, is mainly composed of the substructure (made of Peperino tuff) of the predecessor building, which had been erected on the side of the Capitoline Hill. Originally it was possible to access the upper storeys of the Tabularium through a set of steps leading through the substructures from the Forum. 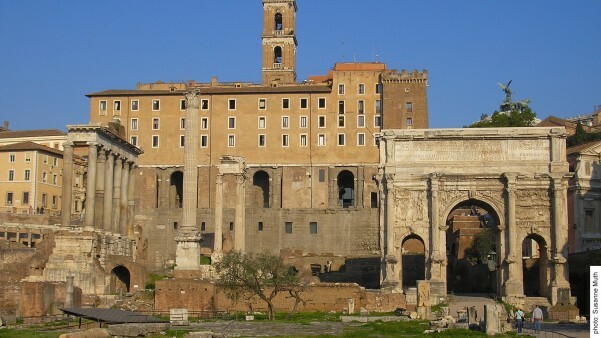 However, this passage was blocked in the Flavian period when the Temple of Vespasian was built. First one arrived at a windowed corridor that can still be seen today. 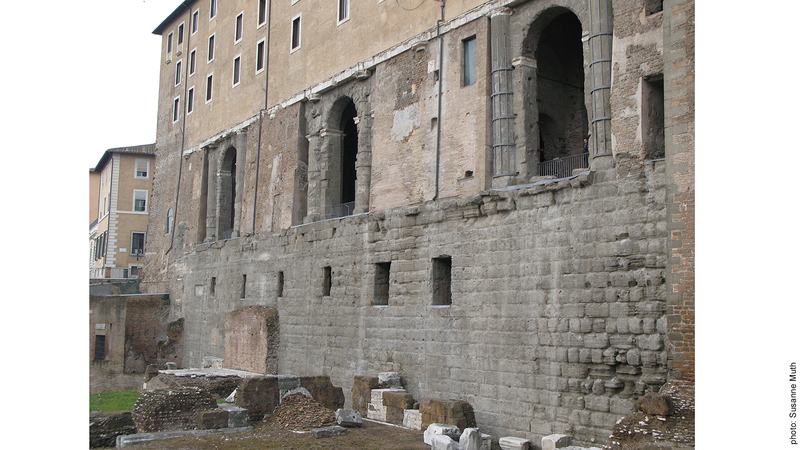 A gallery with arcades whose Doric arch architecture opened the hall onto the Forum was located on the storey above. Several separate smaller rooms are located off the gallery. Because the storeys that were later built upon this gallery with arcades have not survived, it remains unclear how the rest of the upper architecture is to be reconstructed. If it functioned as the state archive, then it must have had sealable rooms for the storage of important documents. In the part of upper storey that has survived, no such rooms can be identified. Thus, we can speculate that such rooms were perhaps located on the second storey of the building. Remnants of monumental Corinthian columns made of travertine, which were found at the foot of the Tabularium, could have originated from the destroyed upper architecture and are sometimes associated with the second storey. In analogy to the preserved first storey, it is reconstructed as a gallery with arcades that open out onto the Forum. However, the columns, which have putatively been ascribed to the second storey, would have been much higher than those of the first storey, which is why some scholars would rather assign the discovered Corinthian fragments to a temple – e.g. a temple standing on the Tabularium itself. 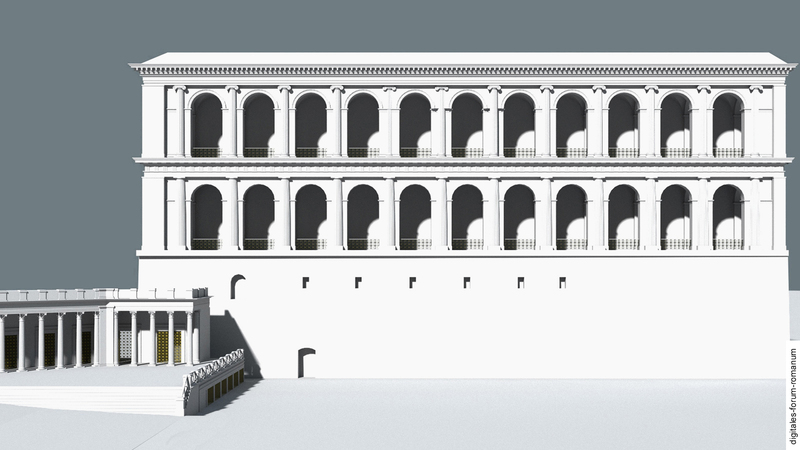 In our model we have opted for a second gallery with arcades of the same height (whereby we have chosen Ionic columns in the place of the Doric columns which stand at the bottom). In our reconstruction we have eschewed introducing a further structure – such as a temple. A. Mura Sommella, Tabularium, in: E.M. Steinby (ed. ), Lexicon Topographicum Urbis Romae V (Rome 1999) 17-20.